In our Berkshires region, access to affordable land is critical to our food security and the sustainability of our local economy. Community ownership of land empowers us to manage land prices and allocate land resources for farms, housing that is affordable for young families, and new, small businesses that are crucial to our economic development. While the region’s land conservation efforts over the years have helped promote a healthy environment and a sustainable community by protecting natural resources from development, the Community Land Trust (CLT) has helped ensure that economically important lands remain affordable and locally controlled. The residential developments at Forest Row in Great Barrington and the Alvastra complex in South Egremont have provided permanently affordable housing for twenty-one families, the site of an internationally prominent library for the Schumacher Center for a New Economics, and a secure home for special-needs individuals as part of Berkshire Village. 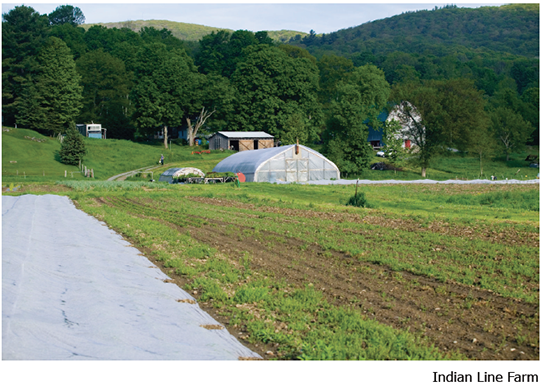 Indian Line Farm in South Egremont, also CLT owned land, was the first Community Supported Agricultural enterprise in the U.S.A.
1. We are planning to expand our collaboration with local conservation organizations, farming groups, and business associations in order to identify appropriate sites and partner in the creation of affordable housing for young people, farm families, and new businesses. 2. The focus of all our upcoming initiatives will have a primary objective of encouraging sustainable (green) building practices that will become a model for similar sized communities. One of the primary results of the suburban sprawl that began carpeting the nation during the 1950s was its excessive dependence on various fossil fuels is climate change. Today, the energy that buildings consume in our country totals approximately 40% of all energy use in our country. Our Land Trust will offer guidelines through its lease agreements that promote energy efficient construction of housing, commercial and industrial buildings on sites designed as sustainably as possible given our current building and land planning technologies. 3. The importance of our farming community cannot be understated, and we are looking forward to increasing the acreage currently in use for growing our food, as this part of our local economy will have to grow to help create a diverse and selfsustaining region. 4. The Berkshires today is an aging community each year with a population that decreases each year while land prices escalate because of pressure from second home purchases. We are concerned that without providing viable opportunities for our young people, we cannot expect them to stay or return to raise their families.That means all of us must work collaboratively to ensure there are well paying jobs and affordable living situations for young people. Both of these objectives begin with affordable access to land. The Berkshire Community Land Trust and its sister organization, the Community Land Trust in the Southern Berkshires were formed to give concerned citizens a way of placing economically important lands into a locally governed trust with the goal of building a vibrant, diverse and sustainable Berkshire community. The CLT then leases the land through long-term agreements (98 years), providing equity to leaseholders for improvements made to the land and buildings and other infrastructure. Citizen-donors are assured that the land will be used in perpetuity for its originally described purposes. To discuss gift of land e-mail info@berkshirecommunitylandtrust.org or call (413) 528-4472. Your tax-exempt donation of dollars can be designated for specific type of land purchase–housing, farms, locally owned retail space, small regionally-appropriate manufacturing sites. Checks should go to Berkshire Community Land Trust, PO Box 276, Great Barrington, MA 01230. The board of the Community Land Trust in the Southern Berkshires and Berkshire Community Land Trust is made up of nine residents of Southern Berkshire County. Three Leasing Member Representatives are elected by other leaseholders. Three Non-Leasing Member Representatives are elected by the general membership. Three Professional Community Representatives are appointed by the Board of Directors for their expertise. Peter is the executive director of Life Needs Coop Inc. dba Stanton Home, which has provided residential and day programs for people with special needs since 1986. He also manages Berkshire Village Inc., a nonprofit that secures homes for people with special needs. He has a master’s degree in nutrition and started The Nutrition Center in 2007. Peter has raised three children in the Berkshires. He is the leaseholder of Orchard House on the Alvastra property in South Egremont. Adam Sugarman is a father, husband, and lifelong Berkshire resident, who currently works as the Customer Service Manager at the Berkshire Co-op Market. He earned his BA from Bard College at Simon’s Rock after studying at St Lawrence University and Shakespeare & Co., and in 2012 he earned an MBA at The Isenberg School of UMASS Amherst, earning a place in the Honors Societies of Beta Gamma Sigma and Phi Kappa Phi. He has worked in many sectors in Berkshire: actor/director, masonry construction, bar-tender, landlord, financial services and insurance professional, fine gardening, and more. Samuel VanSant is a native of Great Barrington and received his degree in American Studies from Bard College at Simon’s Rock. During his time at Simon’s Rock, he developed his first business, VanSant Carpentry. Now Cobalt LLC, his business offers planning, design, and construction services in Berkshire County. He also manages an estate in Lenox and works as a project manager and project planner for a development company. Sam lives in Great Barrington with his wife and four children. He is actively involved with many local organizations and serves on the finance committee and advisory board for Multicultural BRIDGE. 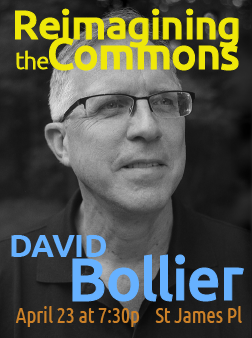 Thanks to Community Television in the Southern Berkshires, David Bollier’s talk at the 2017 Annual Meeting, “Reimagining the Commons” aired on public access television and is now available to watch online. Your tax-deductible donation funds acquisition of land for agricultural, residential and business use as well as educational programs. Copyright © 2017 Community Land Trust in the Southern Berkshires. All rights reserved.